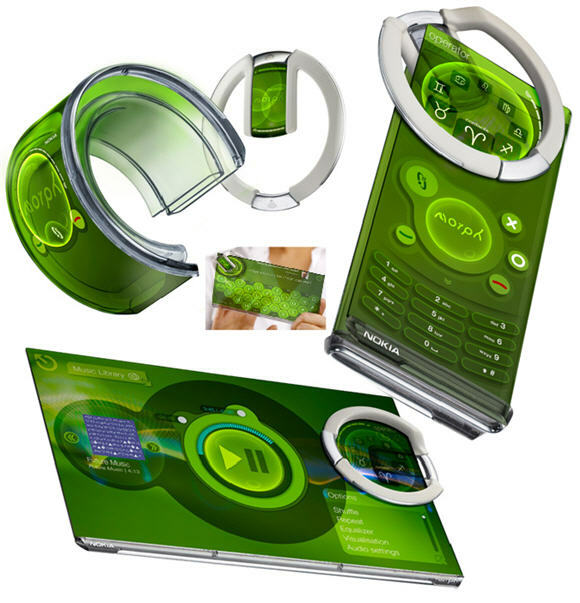 A student alerted me to a video on YouTube demonstrating the Nokia Morph concept phone. This phone might be capable of being flexible, having a self-cleaning surface, detecting environmental factors, and harvesting solar energy. It is a two piece design that would use nanotechnology to accomplish these feats. One nanometer is a billionth of a meter or about the width of three atoms lined up next to each other. When scientists talk about the nanoscale, they are talking really, really small. Apparently, when everyday materials get down to the nanoscale, they start to do really unusual things. Scientists hope to one day use nanotechnology to do things like build the Morph, clean up the environment, design drug-carrying nanoparticles for targeted medical treatment, design more effective cleaners, coat implants (like hip replacements) to help the body better accept the foreign material, design food that indicates when it is spoiling, improve car materials... the list goes on. The truth is, no one really knows yet just what nanotechnology may help us develop in the future. It sounds like science fiction, but some of this technology is already in use. You can check out a list of consumer products that currently use nanotechnology. Antibacterial doorknobs, kodak photopaper, lots of clothing (including pants from L.L. Bean! ), even a teddy bear that allegedly resists bacteria, mold, and mites! If you want to learn more, there are many kid-friendly sites about nanotechnology, including a free BRAINPOP video on nanotechnology, the Lawrence Hall of Science site, kids introduction to the nanoworld, and Nanooze.org. Or you might want to watch this great 30 minute video on nanotechnology basics from UCTV: UC San Diego. These goofy scientists do a good job breaking down a very difficult subject. The Nokia Morph was featured in the MoMA online exhibition "Design and the Elastic Mind". It has been a project of Nokia Research Center and Cambridge Nanoscience Center. the Morph looks like an awesome new technology, of course, but how many years until i'll be able to actually afford one?